Amazon's third generation Kindle is an extraordinary bit of kit whose users genuinely love it - but the chances are you'd love it even more if you knew some of the better tricks it's got up its sleeve. 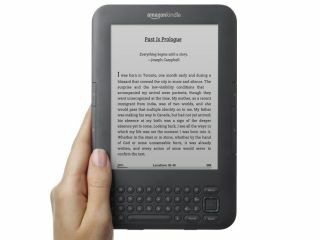 From hidden games to reading books aloud, your Kindle is capable of all kinds of clever things. These are our favourites. The Kindle has a web browser: from the home screen press Menu > Experimental > Launch Browser. It's slow and horrible compared to a desktop or tablet browser, but it's perfectly adequate for browsing news sites, Wikipedia, Amazon and so on. Amazon has hidden a copy of Minesweeper in your Kindle, and you can launch it by pressing Alt, Shift and M simultaneously. Use the arrow keys to navigate and the select button to mark a mine, and when you get fed up press G to play GoMoku, a version of Tic-Tac-Toe. If you bookmark maps.google.com/m/directions in your Kindle's web browser, you can use it to get travel directions if you ever get lost. This is particularly useful in the 3G model, which can get online anywhere there's a 3G mobile phone signal. Your Kindle can display Google Maps too, but the text-only version is faster to use. Each Kindle has a unique email address, and you can email compatible documents to your one by sending them to your Kindle. If you can't remember what it is, log into Amazon.co.uk and go to Your Account > Manage Your Kindle (or on your Kindle's home screen press Menu > Settings > Experimental). Amazon's site also enables you to create a list of approved emails: messages from addresses you haven't approved will be ignored. From time to time your Kindle's screen may become corrupted. Not to worry: a swift Alt-G refreshes the display. If that doesn't work, sliding the power switch to the right and keeping it there until the screen goes completely blank turns your Kindle off completely. If you sign up for the free Instapaper service and install the bookmarklet in your browser, you can send any web page to Instapaper so that you can read it later - and if you give Instapaper your Kindle's email address, you can automatically receive a daily digest of the articles. Download it over Wi-Fi, though: 3G downloads cost 20p per MB. Your Kindle actually has two email addresses: username@kindle.com, and username@free.kindle.com. If you've got a 3G model and you're emailing documents to it, use the free.kindle.com address: Amazon won't try to deliver those messages via 3G, which would cost you money. Google Reader works in your Kindle browser. For best results log in, click on All Items and then press F to enter Full Screen mode. You can now move between articles by pressing J and K.
If Google Reader and Google Maps work, then surely Google Mail works too? Yep - and so does Hotmail, and Facebook. In each case you'll need the mobile versions: mail.live.com/md for Hotmail/Windows Live Mail, m.facebook.com for Facebook and m.gmail.com for Google Mail. If the publisher hasn't disabled it, you can get your Kindle to read your book aloud by pressing the Text menu button (the one with the upper and lower case letter A on it) and selecting Text-to-Speech: Turn On. Shift-Sym then starts and stops the reading feature and the space bar pauses and resumes. Not sure what something means? Use the arrow keys to move the cursor to it and a dictionary definition pops up. Another easy keyboard shortcut: Alt-Shift-G takes a screenshot and stores it as a GIF file in the Documents folder.